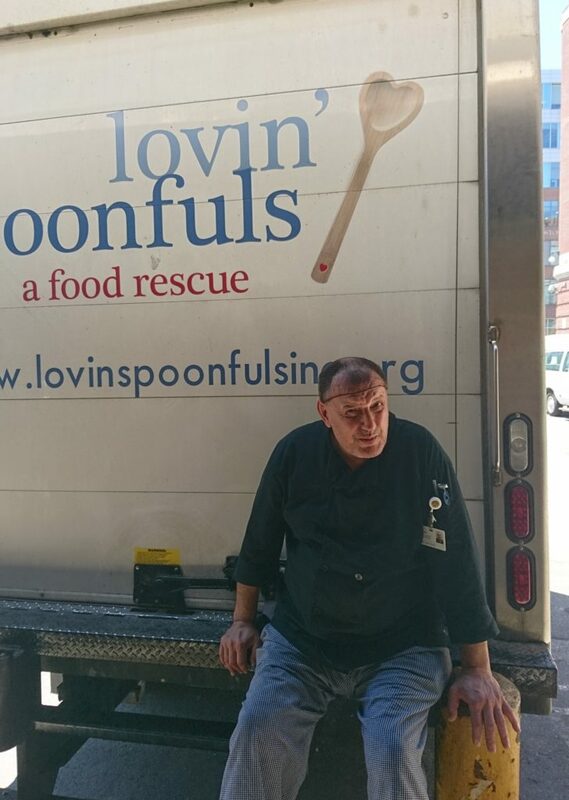 Reggie Nguyen is a Food Rescue Coordinator for Lovin’ Spoonfuls. Below, he recalls a recent visit to CAB Health and Recovery Center. It’s 12:58 and I’m on time, once again, as I reverse into the CAB loading dock. As usual, Chef Lotfi, who oversees the meal program, and his assistant, Wong, are standing by with carts like longshoremen waiting for me to dock. CAB is a drug and alcohol rehabilitation center primarily focused on substance abuse treatment. CAB provides a bed and meals as clients take their crucial first step towards rehabilitation. Chef has been in charge of their kitchen since we began working with them in 2016. His rough exterior is abrasive at times though a tough skin is required in his line of work. Like a stereotypical chef, his demands can be absurd but I have grown to appreciate it. It shows that he cares. CAB clients prefer sugary products because of withdrawal. Most beneficiaries we work with would rather avoid “bad” food but CAB just can’t get enough of it. Rescued pastries and snacks need a home, too. “I’ve got all the bake and sweets you can imagine today, chef!” I say, as I approach. “Wait, wait, I want those men to leave first”, pointing of a group of men smoking and bantering right next to dock. I couldn’t help but reflect on the neighborhood as I waited for his signal to begin. Known as the “Methadone Mile”, the area of Massachusetts Avenue and Melnea Cass where CAB is located, is where the brutal truth of Boston’s opioid epidemic is most apparent. It’s is one of the city’s toughest areas. Homelessness, drug abuse, and mental illness are all out in the open. My 4 years working at a nearby women’s shelter only confirmed its harshness. Some of these men are recent inmates from the nearby county jail. Most of them are seeking help for drug abuse. He has to take precautions; it’s understandable. It is very hard to face despair without succumbing to it, so I’m impressed with his 8 year tenure. Eventually, the men dispersed and Chef give the signal to start unloading. He takes all the pastries in sight while Wong mischievously tests his boss’s temper by checking out the sandwiches. “Put that down Wong! They won’t eat it!” Chef yelled. “Sorry about not having milk, chef. I’ll give you a call if I have some later in the week.” I said as we finished up. We shook hands and I gave a quick stern talk to Wong about the importance of not touching the sandwiches. Wong smirked and shook my hand. It was time to depart as I was already late for my next stop.